Six hundred light years from Earth in the constellation Cygnus, circling a star named Kepler every 290 days, orbits the planet Kepler 22b. 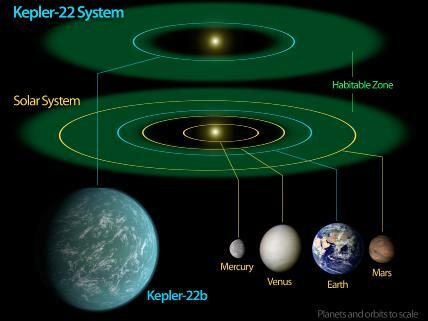 Named for the NASA probe Kepler, this is the first confirmed “earth like” planet in a “habitable” zone. the habitable zone is defined as a planet just the right distance from its Sun to support liquid water.